Mother Teresa declared saint by Pope Francis on 4th September 2016, hailing her work with the destitute of Kolkata as a beacon for mankind and testimony of God’s compassion for the poor. The revered nun’s elevation to Roman Catholicism’s celestial pantheon came in a canonisation mass in St Peter’s square presided over by Pope Francis in the presence of 100,000 pilgrims. “For the honour of the Blessed Trinity… we declare and define Blessed Teresa of Calcutta (Kolkata) to be a Saint and we enroll her among the Saints, decreeing that she is to be venerated as such by the whole Church,” the pontiff said in Latin. 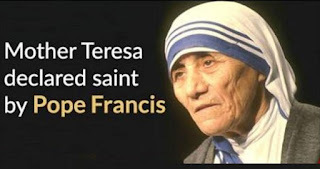 Francis said that even though the nun had been declared a saint, she would always be Mother Teresato the Catholic family. Mother Teresa - the revered nun of Calcutta whose service to the poor and destitute made her a household name and an icon of 20th century humanitarian work, is to be elevated to Catholicism's celestial pantheon on the eve of her 19th death anniversary. President Pranab Mukherjee has expressed happiness over the canonisation of Mother Teresa which will be done by Pope Francis on September 4, 2016 at Vatican City. In his message president said that Mother Teresa was an embodiment of compassion. She dedicated her entire life to serving the poorest of the poor as well as the destitute and forsaken.